I’m ready to do some serious shopping. Chuck and Geri are with me. Right as we enter the vendor area from the parking lot, I spy some nice-looking folding chairs with attached tables, exactly the kind I have in mind. The price is $55 each and I want two. The vendor has some for $45, and while comparison shopping I see some for $40, but none look as well made as the $55 chairs. These chairs are higher than some, and they have handy pockets on one side. After some hesitation and fretting about choice of color, I hand over $110 for two blue chairs. It’s morning and there isn’t a crowd at any of the booths. Next I find a man selling hats. He has more people around his booth than his neighboring vendors. I look for a hat in the style I already have. I want one in a dark color, and it doesn’t take me long to find it. As I go to try it on, the man says, “No, that’s too big for you. You’re a medium. I’ve done this so long, I can tell your hat size just by looking at your head.” Sure enough, the medium fits. He shows me how to tighten the cord at the back to keep the hat from blowing off in wind. “How much?” I ask. “Forty dollars,” he replies. A guy nearby tries to barter. No luck. The hat man is sticking to his price. Geri and I walk away, but the hat is still on my mind. And soon it’s on my head! I walk away happy with my purchase. I know the price is right. I’ve seen these hats online. Forty dollars is what you have to pay, and buying it at Quartzsite I don’t have the hassle of arranging a place for it to be mailed. Besides, this hat feels right. We look at rocks and crystals. Lots of rocks and crystals. Big rocks, little rocks, polished rocks, rough rocks, all different colors of rocks. Crystals as big as a washing machine and crystals that fit in your pocket. Geri loves looking at rocks and crystals. She makes jewelry so we cruise through several bead shops, too. "Um, may I have one pink bead please?" Geri and I meet Chuck back at his favorite booth. No more trying to read a jumping needle on a cheap gauge! It’s a big place with lots of tools and rv stuff. I look for something to insert in the holes of my stabilizer jacks. I can’t find the rod for this purpose that came with my Casita. Voila! A piece of steel that looks like rebar for $1.59. On the way back to the car, we pass the homemade ice cream booth. Uh-oh. I’m a sucker for raspberry ice cream. One large scoop on a regular cone . . . $5.00. Ouch! But, boy, is it good. Before leaving Quartzite I buy six. natural white, LED bulbs at an rv supply store. Total cost: $74.85 plus $7.58 tax. Super ouch! 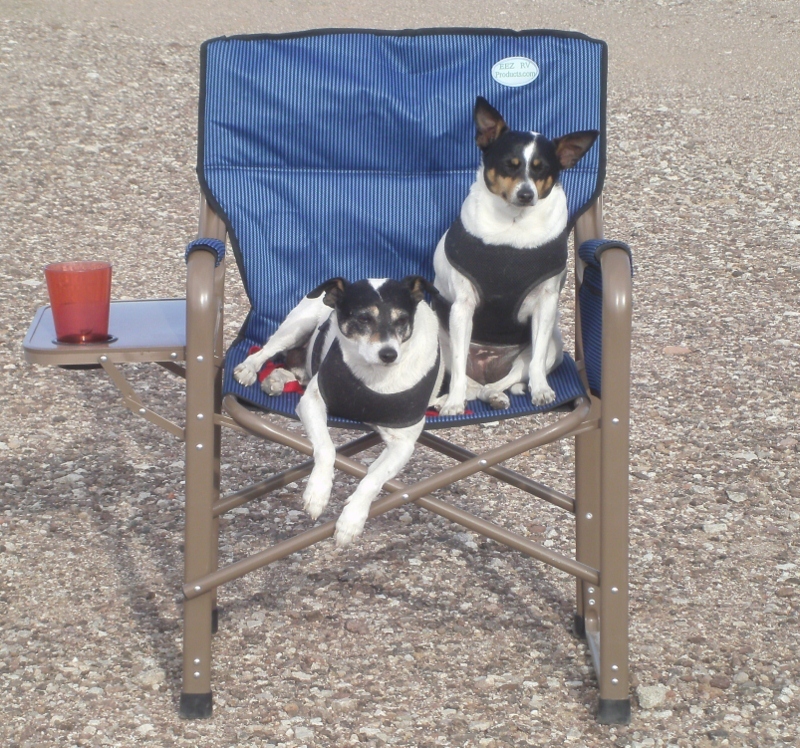 This entry was posted in Simple living and tagged beads, camp chairs, chocks, crystals, gauge, hats, Quartzsite, rocks. Bookmark the permalink. Wow what a place, sounds amazing, I love the adult baby sitting place lol… All the purchases you made sound very reasonable and things you need. Loved all those beads and love rocks, my son collects rocks for me all the time and brings them home for me, which i show off in glass jars around my house. Sounds like that place would be dangerous – he would want me to have at least one of every crystal, of course mom would have to buy, lol. Glad to see you got the crew a nice chair, lol… take care looking forwarded to hearing and seeing more. I doubt Mom could buy one of every crystal . . Some are very beautiful and huge, and very expensive. Your son would probably like the geodes. There were some so big a person could lie down inside. You are lucky to get out of Quartzsite for so cheap. There is just SO much of everything. I think the trick is to get in and get out fast before the pocketbook shrivels up. . . and before you get hungry. At the ice cream place. Did you notice they didnt show a price? Atleast I didnt see one so I skipped it. It’s written on a board placed about 7 feet above eye level! Thanks Sue, That was FUN. I love that chair though! So much nicer looking than my $12 one from Walmart that is already falling apart. It might not even make it long enough to go RVing, heh. I’ve got you beat in the cheap chair contest. I’ve been sitting in a $5 chair I bought at the grocery store about a year ago. The canvas is ripped and it’s torture for the back. You missed one very important purchase, Sue. An apple fritter from the Quartzsite Bakery at 415 E. Main St. I have it on good authority that the fritter qualifies as a fruit serving and not as junk food!! Might just bump into you here or there. Chris and Clete bought a homemade apple pie they had ordered from one of the booths . . . I think her name is Mary . . . The air around that booth is intoxicating . . . Sounds like the fritter is of the same calibre . . .
Just spent some time catching up on your adventures! You looked so relaxed in those photos grilling hot dogs over the fire. Do your teacher friends from Georgia see a difference? I’m up to my ears in cleaning out the house for the short sale. Giving away, throwing away (a little), etc… If the sale moves through quickly, I may have a month or so to hit the road with my little trailer and give the lifestyle a quick try. I see it in my future… Your adventures are very inspiring! How exciting, Pat! To be so close to rolling down the road . . .
One of my teacher friends back in Georgia did say, “You look so happy!” I guess I’ve lost my math-teacher-evil-look. Here’s to the best future for you! Oops! I’d better catch up on my blog writing. . . .
Q looks awesome! Just a tip about that tire guage (we have the same one). It’s heat/cold sensitive so don’t keep it in the PTV. Keep it in the Casita or it’ll get tempermental on you! This is what is great about having a blog. I appreciate the advice. I’ll get it out of the PTV ASAP. Quartzsite will probably be a lot busier and livelier when you get there. Have a great time, Sue! You read my mind about the old chair! Sue, I love the picture of the Crew enjoying your new chair. It’s a good thing you bought two or you would be sitting on your old chair. They look very comfy. Quartzite looks like a fantastic place to shop. Is this event at a set time each year? It was fun sharing my first visit (this century) to Quartzsite with you! It was fun fun fun!!!! I don’t believe it! Two Crazy Ladies is one of the vendors at the dog shows up here in WA/OR. I’ve purchased several items from them. Small world! Wow, the bead shops and the tie-died shirts. Just your photo’s show me that I would be spending too much money there! I could be lured in by the bead store, but I do like picking out two of something instead of a strand. So, is Q just one big carnival? I should see it, but I think I’d prefer someplace quiet. We just got into AZ tonight … yee haw!